assists manager (070) q.v. and acts in his absence; enforces observance of Acts of Parliament, and special rules issued thereunder. makes daily inspections of working places, overburdens, paths, roads, etc. ; takes steps to ensure safe and efficient working; work often performed by manager or agent (070) q.v. see inspector (slate, stone, etc.). legal title of deputy q.v. holding certificate to fire shots; cf. blaster (072). (ii) is responsible for statutory duties under Acts of Parliament, where there is no deputy. is in charge of drillers and firemen (072) q.v. ; determines kind and quantity of explosive used and supervises its distribution. directs work of quarriers (072) q.v. to obtain best possible output of stone, etc., from quarry face. (ii) is in charge of a set of workmen. examines slate or stone after dressing for damage or defects; checks output of dressers. usually a pit carpenter (474) q.v. who inspects wagons and keeps them in repair. see foreman; cf. agent (070). contracts with quarry owner or agent to get stone, etc., at fixed rate; employs and pays his own assistants; is usually himself a quarrier (072) q.v. 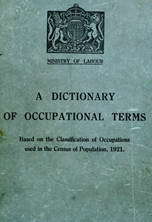 in complete control of technical and commercial affaus of mine or quarry, pit, or working and is responsible to directors or owner alone for observance of Acts of Parliament and of regulations made thereunder, for safety and discipline of men and boys employed and for maintaining output. an agent q.v. who controls the operative or technical affairs only of a quarry, etc. slang terms for captain or manager q.v. a foreman (071) q.v. endowed with fuller powers of control as owner's representative or agent q.v. ; usually in small workings. in charge of all means of conveyance in or about mine or quarry. a person who, or member of a body corporate which, is the immediate proprietor or lessee of a mine or quarry, or of any part thereof.